Whether you are missing a single tooth or many teeth, the question comes to mind: should I get dentures or dental implants? Our Orange County advise visiting a medical professional in order to get a proper diagnosis. This being said, each of these treatments has their own list of pros and cons. A dental specialist can make a recommendation, but ultimately the final decision is yours. To help guide you through this tough process we have compiled a list of pros and cons for dentures and implants to help you make an informed decision. Dental specialists have utilized dentures for decades. They are often portrayed in public media as a full set of removable teeth often being used by a parent or grandparent. At our Los Angeles office, our dentures of molded in order to achieve a proper fit and secured through the use of an adhesive. Dentures are typically removed at the end of each day before bed. Additionally, dentures should be soaked overnight for proper cleaning. It is important to remember that no matter how good your dentist is able to make your dentures, they will never feel 100% like your natural teeth. This being said, a lot of people enjoy the option of being able to remove their teeth as needed. Another important factor about dentures is that when removed, your jaw begins to weaken due to the lack of pressure from teeth. If your jaw is already too weak for dental implants, dentures are a great solution for you. Another important thing to remember is that adhesives used in dentures are not 100% reliable. Your dentures may fall out from time-to-time. It is important to pay attention if you want to avoid this from happening to you. When choosing dentures, our Huntington Beach Dentist suggest prioritizing quality above all else. Your dentures will essentially become a part of you so it is important not to cut corners. On average, with proper care, a set of dentures will last you 5 years. Dental implants are a more modern alternative to tooth replacement. Our dentists in our Los Angeles office advise choosing dental implants for a more natural looking dental replacement. Implants are made on a case by case basis and often times mirror the natural color of your teeth. 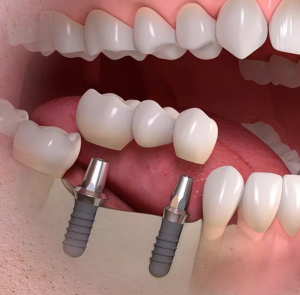 Dental implants are composed of two major parts, a titanium post, and the crown. The titanium post is surgically attached to your jaw and left to heal. The jaw heals around the titanium post essentially creating an artificial root of your tooth. The custom crown is attached to the titanium post after the area has properly healed. This creates an extremely natural looking replacement. Dental implants consistently stimulate your jaw thus are a much better long-term solution for your jaw. Implants and dentures can be utilized together. Overdentures, the official name of this process, combines the latest dental technology in combination with dentures. This allows dentists to install dentures that feel closer to natural teeth. Overdentures solve the issue of slipping and in many cases make chewing, speaking and other everyday activities a lot more comfortable compared to their older counterpart. With proper care, dental implants should be able to last a lifetime. Our Dentist in Huntington Beach office provides high-quality dental implants utilizing the latest in dental technology. Though dental implants tend to be more expensive, they are a more comfortable, longer lasting solution. Should I get Dental Implants or Dentures? When deciding on which option you want to move forward with, factors such as lifestyle, budget, and health are all things to consider. It is important to find areas that you are willing to compromise on because either option will be a part of your daily life for the foreseeable future.